Every year an unknown number of hedgehogs die or suffer horrific injuries because bonfire piles are not checked before being lit. 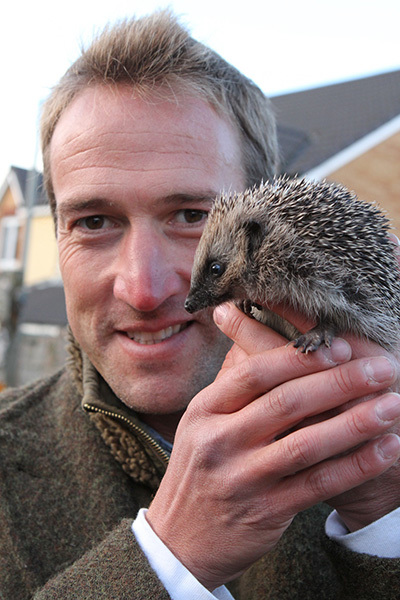 To save hedgehogs and other wildlife from appalling suffering Ben Fogle, Patron of the British Hedgehog Preservation Society (BHPS) is backing the Society’s plea that bonfires should not be built until the day they are to be lit. This will not only save wildlife from burning to death but will also stop the bonfire from getting soaked should it rain the night before! Fay Vass, Chief Executive of BHPS, said “Piles of bonfire material look like five star hotels to a hedgehog in search of a hibernation site. It is important to dismantle and move bonfire material that has been stored in advance on open ground. Move it to another spot just before lighting. Ensure it’s moved to clear ground – never on top of a pile of leaves as there could be a hedgehog underneath, and not too close to pampas grass which can ignite very easily and is another favourite spot for hedgehogs to hide under.” If, whilst building, a bonfire is left unattended, for however short a time; it’s imperative to check for hedgehogs and other animals, including family pets, before lighting. Ben says “Please remember to check bonfires carefully for hedgehogs and other animals prior to lighting. Then if it is clear, light only from one side so as to allow an escape route for anything you may have missed.” As hedgehogs tend to hide in the centre and bottom two feet of the bonfire, check by gently lifting the bonfire section by section with a pole or broom. Never use a spade or fork as these can stab them. Using a torch will help and listen for a hissing sound, as this is the noise they make when disturbed. Fay continues “If hedgehogs are found, take as much of the nest as you can and place them in a high-sided cardboard box with plenty of newspaper/old towelling. Ensure there are air holes in the lid and that the lid is secured firmly to the box, as hedgehogs are great climbers. Wear garden gloves so you don’t get human smells on them and to minimise stress caused to the hedgehog, also, it protects your hands from their spikes. Put the box in a safe place such as a shed or garage well away from the festivities and offer them meaty cat or dog food and fresh water to drink. Once the bonfire is totally dampened down, release the hedgehog under a hedge, bush or behind a stack of logs with more food and water.” Going to an official organised fireworks display is a far safer option for both humans and animals. For advice and to obtain the names of carers in your area in advance of bonfire night, contact the BHPS on 01584 890 801.